The question of whether IQ (Intelligence Quotient) scores vary (significantly) from country to country may sound terribly racist and unapproachable. But first, no question, if honestly asked and investigated, should be taboo; and second, the question sounds racist only if one believes that any such differences (if found) will be attributed to racial characteristics, rather than developmental factors. 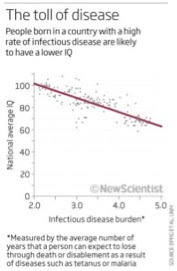 But a recent study found an interesting correlation between average IQ scores and rates of infectious diseases in various countries. More clearly, the more widespread is malaria, for instance, the lower the average IQ will be in that country… That’s what Christopher Eppig (a Ph.D. candidate in biology at the University of New Mexico, Albuquerque) and his colleagues reported in a paper they published in July in the Proceedings of the Royal Society B (see the diagram below, from New Scientist). How could those two factors (IQ and infectious diseases) be correlated? 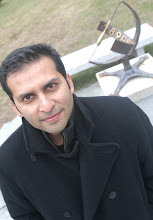 The interpretation that has been offered holds that parasitic infections rob the body – and thus the brain – of infants of much energy and divert body resources to fighting the disease and pumping up the immune system, hence reducing the capacity of the brain to perform at higher rates and levels. The researchers insist that they did control for other factors that could affect IQ scores, including education opportunities, income levels, and even climate (as colder lands have been theorized to help improve IQ scores… from an evolutionary perspective…). "Controversially, some researchers have postulated a reverse correlation between IQ and development level; that is, countries with higher average IQ’s will reach greater economic levels, not the other way around." I would argue that the co-relation is true both ways. If a country has more intelligent people, they will develop faster. Similarly, if a country develops, they will have more intelligent people. My reason being, intelligence is something inherent (may be it can developed too to an extent). But unless intelligence is exercised, no one will know how intelligent someone is. There is no intelligence detection device as such. Exrecising the intelligence of its people will make a country develop. Similarly, when a country develops, there will be more opportunities for its people to exercise their (otherwise unused) intelligence. If aliens from another rock visited the Earth, will that mean they are more intelligent than us, human beings? Thanks for your pertinent comments. However, one must be careful with apparent, intuitively true statements; any claim should be borne out by studies, statistics, and analyses. So I am not sure if that holds true upon closer examination. Now, regarding extra-terrestrials and higher intelligence, well just be a little patient, I am readying a review of Paul Davies' latest book on ET searches and expectations (The Eerie Silence). "If aliens from another rock visited the Earth, will that mean they are more intelligent than us, human beings?" Well, they will certainly be more technologically advanced (if they get here). The question of intelligence is difficult to answer. That will have to be addressed independently - since the two biological systems are expected to be completely different! One interesting question can be: If we encounter humans from a thousand years ago - we will be leaps ahead in technology and our understanding of the natural world. But what about intelligence (probably not that much) - and how long will it take them to catch-up in IQ? I too have Paul Davis' book on my reading list. I like the title. I got The Grand Design last week and I was like a child who got a new toy. Almost euphoric. But the more I read, the more my euphoria faded. "But what about intelligence (probably not that much) - and how long will it take them to catch-up in IQ?" If intelligence is the same, what is there to catch up?